In 1987, drilling for the well started in the city centre. The well draws water from an aquifer 1800m under the surface, at a temperature of 76°C. The system is contained under a red corrugated building next to WestQuay and IKEA. It provides 13 GWh of energy a year, and helps to provide the heating for several buildings, including WestQuay, the Civic Centre, and Royal South Hants Hospital. The amount of energy the system supplies is relatively low considering the amount of research and money put into developing it, but it is still considered as an efficient method of heating several buildings in the city centre around 30 years later! With that in mind, as far as I can tell, Southampton’s very own geothermal project has been a success. To date, there has still been very little further research and development into the practical use of geothermal energy in the UK. There has been a small amount of research in Cornwall, and a similar system to Southampton’s is currently being developed for use in Stoke-on-Trent. Despite this, there’s evidence that geothermal has the potential to be able to supply a fairly significant portion of the UK’s energy and heating needs, and increased use and research would surely decrease the cost. While there are several methods of sustainable energy sources that can be implemented in the UK to help replace the use of fossil fuels, it seems clear to me that perhaps geothermal power is an option that shouldn’t be overlooked. According to a LinkedIn post by Tom Wu, Salesman - ZheJiang KaiShan Compressor Co., Ltd., on November 29, on the outskirts of Budapest, Hungary, the Tura geothermal power station project was formally grid-connected. This is the first geothermal power station in Hungary. The project is designed and built entirely in accordance with European standards and has undergone strict inspection and acceptance and has obtained grid-connected licenses. The project uses a patented "one well" cascade ORC screw expansion power generation technology. The power station generates 3.35 MWe of electricity and 5.233 MWth of heating for greenhouses. Mapping of the potential geothermal reservoirs in Denmark. WellPerform of Copenhagen and DTU CERE - the Center for Energy Resources Engineering at Denmark Technical University, have engaged in a joint study project through the Scion DTU foundation that will run during the next year. Based on the experience and knowledge of both DTU and WellPerform, it is our vision to create a commercially viable geothermal energy solution, that will be available for residential, commercial, and industrial heat consumers, in the pursuit of a low-cost, environmentally friendly energy resource. For more information on our Scion DTU project, you are welcome to contact Reuben Munnee at rm@wellperform.com. 17:30 – 18:00 Plenary in presentation room, Professor Jan Diederik van Wees, Geothermal energy in The Netherlands and the UDG projects. Puga Valley in the Ladakh region of Jammu & Kashmir is one of the areas showing significant potential for geothermal energy. Puga lies in the south-eastern part of Ladakh and forms a part of the Himalayan geothermal belt. This zone shows evidence of geothermal activity in the form of hot springs, mud pools, sulphur and borax deposits. “Since Ladakh lies in the confluence of two continental plates, geothermal (energy) can be found easily here. The potential is strong as we have good source of water due to rivers and hot springs,” Jigmet Takpa, Director, Ladakh Renewable Energy Development Agency (LREDA), told indiaclimatedialogue.net. “More survey is needed to test the depth in the valley. We need to reach a minimum of 2 km depth to see how temperature changes, if it is earth’s heat or magma, or if lava is coming out.” To find the real potential in Puga Valley, there is a need for in-depth information on the reservoirs. According to a paper titled Assessment of subsurface temperature distribution from the gauged wells of Puga Valley, Ladakh published in the Geothermal Energy journal in 2017, it is estimated that over 5,000 MWh of geothermal energy is available at Puga at current depths, which could be used for heating, greenhouse cultivation and electricity generation. Studies have indicated that there is a 90% probability that the Puga field could sustain a 20 MW power plant at the current shallow depth of drilling. A 20 MW geothermal plant at Puga could save three million litres of diesel burnt annually in the region at a cost of approximately USD 2 million. Sponsored by Congressman Raúl Labrador, the “Enhancing Geothermal Production on Federal Lands Act” seeks to incentivize new production of geothermal energy resources on federal lands, and support increased production on lands already leased for that purpose. To achieve these goals, this bill amends the Geothermal Steam Act of 1970 to create a Categorical Exclusion (CX) under the National Environmental Policy Act of 1969 (NEPA) for qualifying geothermal exploration test projects, permit coproduction of geothermal resources on land leased for oil and gas, and allow for noncompetitive leasing on federal lands adjacent to other lands currently leased for geothermal energy production. The Geothermal Greenhouse Partnership (GGP) will begin construction of two more growing dome greenhouses — the Community Garden Dome and the Innovation Dome — in spring 2018. These two domes will be installed next to the existing Education Dome in Pagosa Springs’ Centennial Park on a parcel leased from the Town of Pagosa Springs. The Colorado Water Plan (CWP) Engagement and Innovation Fund granted Geothermal Greenhouse Partnership $174,500 for the construction of the nonprofit organization’s second and third growing domes. The Colorado Water Conservation Board approved the CWP grant earlier in November. These funds, coupled with a $34,000 matching grant from Colorado Garden Foundation awarded last February, allow the GGP to fulfill its agreement to build three geothermal greenhouses. La nuova Strategia Energetica Nazionale riconosce questo ruolo ed in prospettiva pone la sfida di una «geotermia ad emissioni zero» che oltre ad essere rinnovabile sia anche a zero impronta carbonica. Proprio in questa direzione Baker Hughes, a GE company (BHGE) sta collaborando attivamente per la progettazione e la realizzazione di un impianto attraverso soluzioni tecnologiche che permetterà di generare energia elettrica utilizzando i vapori provenienti dal sottosuolo senza alcuna dispersione o fuoriuscita nell’ambiente, parte di uno dei progetti sperimentali del Ministero dello Sviluppo Economico. L’impianto consiste in un sistema binario ORC dove è unito ad un compressore alternativo per la reiniezione dei gas, un’applicazione del tutto innovativa di una delle tecnologie di BHGE, solitamente utilizzata per il recupero della dispersione del calore generato dagli impianti ad idrocarburi e che per la prima volta viene applicata nel settore della geotermia e che include anche le soluzioni Digital di BHGE, costruite sulla tecnologia Predix. (From Google Translation) The new National Energy Strategy recognizes this role and poses the challenge of a "zero emission geothermal plant" that, in addition to being renewable, is even zero-carbon. Precisely in this direction, Baker Hughes, a GE company (BHGE) is actively contributing to the design and implementation of a plant through technological solutions that will generate electricity using geothermal steam without any dispersal or leakage into the environment, part of one of the experimental projects of the Ministry of Economical progress. 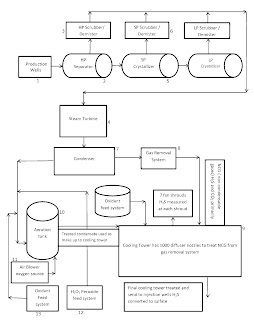 The system consists of an ORC binary system combined with an alternative gas reinjection compressor, an entirely innovative application of one of BHGE's technologies, usually used for recovering the heat dispersion generated by hydrocarbon plants and which is for the first time applied to the geothermal industry and also includes BHGE's Digital Solutions , built on Predix technology. Power producer KenGen says it is awaiting regulatory approvals to launch a subsidiary that will oversee its non-electricity generating business. The subsidiary, named KenGen Energy Services (KES), will handle diversified business segments that will be hived off from KenGen, leaving the mother company to handle power production and sales. KenGen has in the recent past diversified its revenue streams to include the sale of geothermal steam to flower firms in Naivasha, drilling geothermal wells for other firms, running its geothermal spa in Olkaria and a planned industrial park. It is also offering energy consultancy services to power sector players in the country and the region. Chief Executive Rebecca Miano said in an interview the subsidiary would also explore other revenue streams as the firm looks to grow revenues while reducing reliance on energy generation. The German based Geoenergie Kirchweidach (GEK) and the Swedish clean tech company Climeon have today signed a non-binding Letter of Intent (LOI) covering a supply of Climeon Heat Power modules to a geothermal power plant project in the Municipality of Kirchweidach. The potential order value is estimated to be about 5 MEUR. The LOI is based on Climeon’s patented Heat Power technology with record high efficiency in low temperatures that will utilize the excess heat of the geothermal plant that today delivers heat to a 20 hectares green house and the city of Kirchweidach, east of Munich in Bavaria. The owners of GEK have previously had a discrepancy in how to best develop the geothermal power plant. Now, with the solution proposed by Climeon, all parties have an aligned view on how to develop the geothermal asset. The parties are currently negotiating financing solutions. If financing is secured and the parties have agreed upon a final purchase order for a Heat Power system, a contract will be signed. MGX Minerals Inc. of Vancouver, Canada, continues to explore the latest technologies in mineral extraction, saying its partner PurLucid, also based in Canada, has developed a high temperature filtration method to purify geothermal brines - similar to oil field brines. Geothermal brines, like those from oilfields, contain concentrated amounts of metals and dissolved salts, including lithium and gold. A barrier in the industry has been the need to reduce brine temperatures so filtration can occur - a barrier known as scaling that severely reduces flow and heat transfer of geothermal heat exchangers. But Purlucid and MGX have now developed a proprietary, low energy design process that removes these scale-forming ions and dissolved salts while not requiring a reduction in brine temperatures for filtration to occur, said the company. Notably, the process uses PurLucid's existing patented and exclusively licensed replaceable membrane skin layers (RSL) filtration system. Similar to MGX's existing wastewater treatment and rapid petrolithium recovery units, MGX and PurLucid are now undertaking studies to build treatment systems capable of being integrated into existing geothermal infrastructure or incorporated as standalone systems for mineral and metals extraction. …to conduct cutting-edge renewable energy research on behalf of the Geothermal Technologies Office. The Homestake Gold Mine in Lead, South Dakota, was once the largest and deepest gold mine in all of North America. It produced approximately 41 million ounces of gold during 126 years of operation. In 2002, the mine was shuttered when the gold veins vanished. Then, after pumping and maintenance costs increased, the Barrick Gold Corporation let the mine slowly fill with water. Lawrence Berkeley National Lab is partnering with seven other DOE national labs and six universities to develop field experiments focused on understanding and modeling rock fractures, an essential element of “enhanced geothermal systems.” With this research, they could help unlock 100-plus gigawatts of EGS potential. Sponsored by the DOE’s Geothermal Technologies Office, Pacific Northwest National Laboratory (PNNL) in Washington State, USA “rewrote the book” on the operation of Organic Rankine cycle (ORC) systems in an effort to make a transformational advance in the technology and its use within the geothermal industry. The PNNL-developed system—the Harmonic Adsorption Recuperative Power System (HARP)—uses a novel approach that eliminates the need for the evaporator, high pressure pump, and condenser in ORC systems. 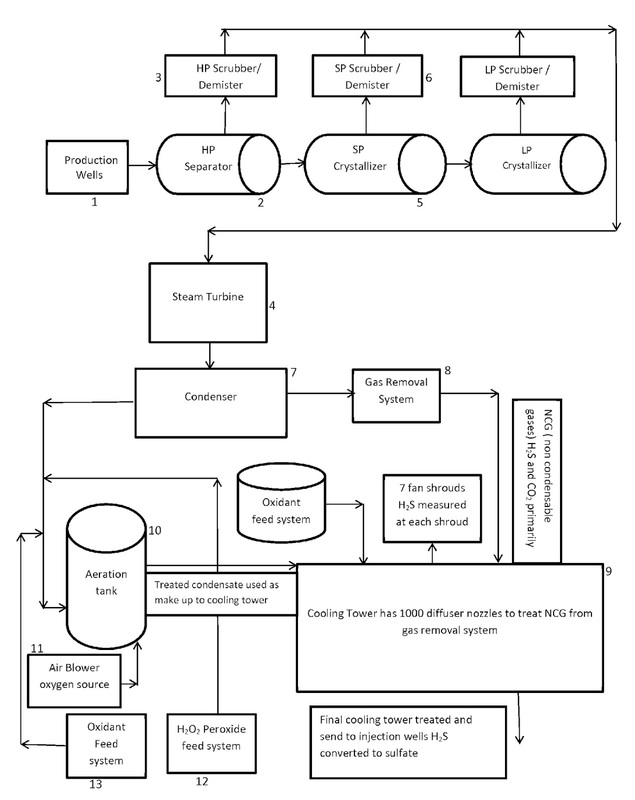 Conventional ORC systems work by transferring heat to a working fluid until it vaporizes at a constant pressure. The high-pressure vapor is passed through a turbine, or other engine, that produces electricity. The vapor is then condensed back to a liquid and recycled using an electric powered pump. The HARP cycle scraps all those components and substitutes a patented multi-bed heat engine architecture and a specially formulated metal organic framework (MOF) sorbent to drive the engine. A method of reducing hydrogen sulfide content in a medium is disclosed. The method may include the steps of contacting a medium containing hydrogen sulfide with an effective amount of hydrogen peroxide, contacting the medium with an oxidizing agent, converting the hydrogen sulfide to sulfate, and reducing the hydrogen sulfide content in the medium. The medium may be a gas or a liquid. The geothermal sector has expressed support for Spanish MEP José Blanco López’ report on the Renewable Energy Directive adopted today and the high ambition on energy efficiency. The vote in the European Parliament’s Committee on Industry, Research and Energy (ITRE) strongly backs a 35% target for renewables and 40% energy efficiency in 2030. The geothermal sector, which provides solutions for energy-efficient renewable heating and cooling, welcomes these targets that allow for a robust internal market. Crews working for the U.S. Geological Survey Research Drilling Unit are anticipated to begin work on a groundwater monitoring well in the northwest portion of the Mammoth Mountain RV Park in Mammoth Lakes, California, during the week of Nov. 27. 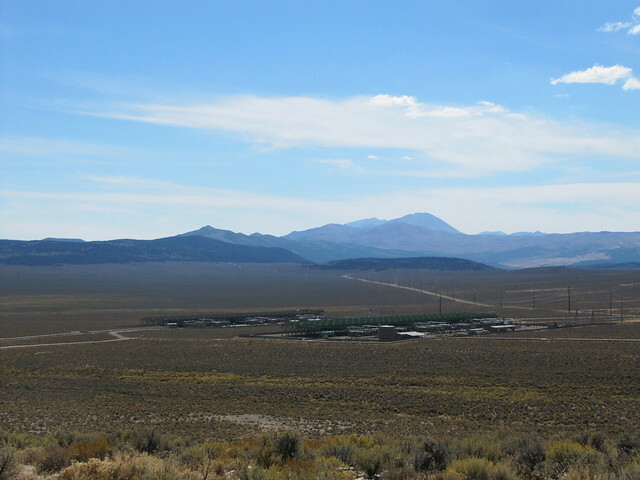 The Bureau of Land Management (BLM), in coordination with the Inyo National Forest, Mammoth Lakes Ranger District, approved the well installation as part of the Groundwater Monitoring and Response Plan for the Casa Diablo IV Geothermal Development Project. Mammoth Mountain RV Park operates on national forest system land under a Special Use Permit with the Inyo National Forest. Small geothermal demonstration project in Valemount enjoys all party support. Regardless of whether the BC NDP government decides to finish or cancel Site C dam, proponents of geothermal power are now hopeful that at least one small demonstration project may move forward. They hope that it will prove that geothermal energy can be developed in B.C. for a reasonable price, despite the costly failures of the past. The project is near Valemount, B.C., which lies just outside of Mount Robson Provincial Park. It was recently the subject of “raging agreement” in the legislature, where all three parties voiced support for the project. The one holdup has been a drilling permit, which is still awaiting cabinet approval. Once that is granted, Borealis GeoPower would drill a test well to determine the energy potential of a hot aquifer at Canoe Reach near Valemount. The first phase of a three-phase project would be hot springs that the Valemount Geothermal Society wants to develop. The second phase would be a small power plant that would produce one megawatt (MW) of electricity – nearly enough to supply the town of Valemount (population 1,100). The third phase would be a larger, 15-MW power plant. 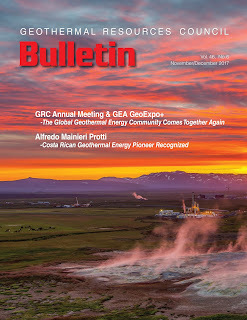 The Geothermal Resources Council (GRC) has made available the latest GRC Bulletin, the voice of the global geothermal energy industry, published continuously since 1972. The GRC has generously provided 3 pages from the latest issue for free! However, the full issue is 44 pages! In this issue, there is an article on the Alfredo Mainieri Protti Geothermal Field - Formerly Miravalles, a report on this year's successful GRC Annual Meeting & GEA GeoExpo+ and 16 pages of geothermal news from around the world. Geothermal heat flux (GHF) is a crucial boundary condition for making accurate predictions of ice sheet mass loss, yet it is poorly known in Greenland due to inaccessibility of the bedrock. Here we use a machine learning algorithm on a large collection of relevant geologic features and global GHF measurements, and produce a GHF map in Greenland which we argue is within ∼15% accuracy. The main features of our predicted GHF map include a large region with high GHF in central-north Greenland surrounding the NorthGRIP ice core site, and hotspots in the Jakobshavn Isbræ catchment, upstream of Petermann Gletscher, and near the terminus of Nioghalvfjerdsfjorden glacier. Nevis commences it's Geothermal Development with Geothermal confirmation "Test-Well" drilling, during today's ribbon-cutting ceremony. To begin drilling operations, Deputy Premier, Mark Brantley and President of NREI/TEP, Daniel Pfeffer were both onsite to kick-off test well operations. This well is to confirm geothermal reservoir properties including flow rate, temperature and sustainability. There is a delightful irony that the legacy of the dirtiest of fuels, coal, now has the potential to deliver a low carbon energy future. Abandoned coal mines seem incredibly promising due to their networks of flooded galleries and shafts lying at depths of up to several hundred metres below the surface. One can be almost certain that the water flow necessary for deep geothermal wells will be found in these flooded underground voids. The risk of not finding flowing water underground can inhibit deep geothermal developments elsewhere. The volume of coal extracted compares to an equivalent void volume underground. On this basis (once allowing for subsidence), we estimate that the abandoned mines of the UK contain around two billion cubic metres of water at temperatures which are constantly around 12-16°C, and in some instances higher still. If heat corresponding to a 4°C temperature drop was removed from this volume, around 38,500TJ of heat could be liberated. This conservative estimate could provide enough heat for around 650,000 homes nationally. 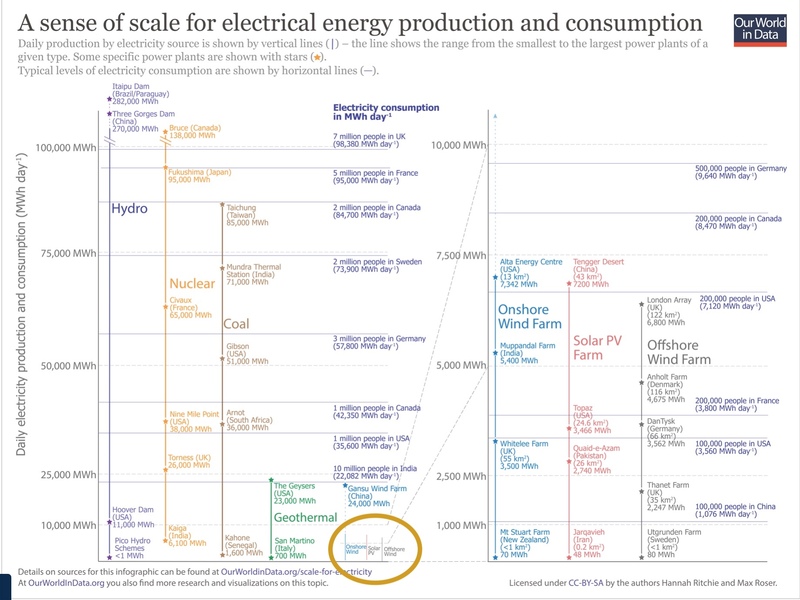 The chart below, from Max Roser, the project director of the “Our World in Data” site housed at Oxford University, shows in two panels how more dense forms of electricity prevail in the real world. The neat thing about the chart is that it matches up electricity production with demand—specifically how many people the specific source can supply. Well pad to power plant snapshot of the Efeler 1 gathering system located in Germencik, Turkey. Owner and operator Gurmat. Turkey is an emerging superstar in the geothermal energy field thanks to a combination of its underground resources and a stable tariff regime. Other countries in Southeast Europe can’t hope to emulate the kind of investment seen in Turkey, the site of some of the world’s largest geothermal power plants, but they too are increasingly harnessing underground energy to provide cheap and eco-friendly local heating and energy. 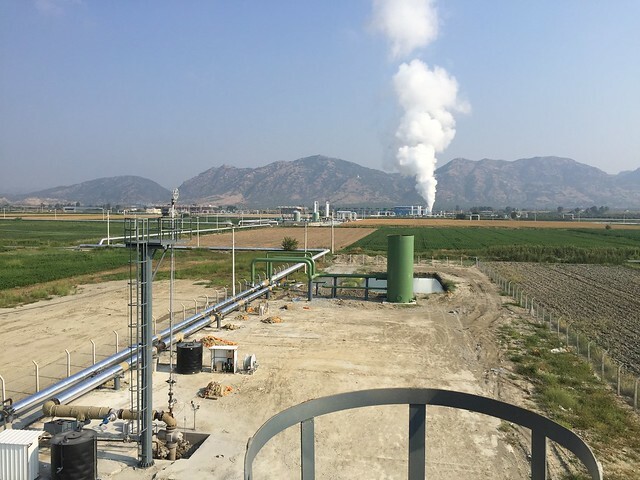 A utility-scale geothermal power plant may be beyond the reach of most of the Balkan countries northwest of Turkey, but this hasn’t stopped them looking to tap their more modest geothermal resources for example for district heating, or to power greenhouses. And the region has long used thermal waters for spas, from the Ottoman era Turkish baths in Budapest to Europe’s largest waterpark, the brand new Therme in the outskirts of Bucharest. A geothermal energy project by Newcastle University involves drilling 6,000 feet beneath the old Newcastle Brown Brewery to reach waters of 80C, which will be used to heat a shopping centre and university buildings. Esto lo dio a conocer en el marco de la inauguración de la central Geotermoeléctrica Los Humeros III Fase A en el municipio de Chignautla, donde se invirtieron más de 800 millones de pesos, beneficiando a 130 mil habitantes de la región. En dicho acto, el Director General de la Comisión Federal de Electricidad, Jaime Hernández Martínez, detalló que con la [25 MW] ampliación del complejo de los Humeros se contará con una capacidad total de 94 megawatts, lo que equivale a iluminar 60 mil hogares y se evitará la emisión de más de 131 mil toneladas de dióxido de carbono al año. (From Google Translation) ...Announced at the inauguration of the Geotermoeléctrica Los Humeros III Phase A in the municipality of Chignautla, where more than 800 million pesos were invested, benefiting 130 thousand inhabitants of the region. The General Director of the Federal Electricity Commission, Jaime Hernández Martínez, explained that with the [25 MW] extension of the Humeros complex the total capacity is now 94 megawatts, which is enough to power 60 thousand homes and avoid the emission of more than 131 thousand tons of carbon dioxide per year. Lake County Special Districts Administrator Jan Coppinger was the guest speaker at the fall Geysers Geothermal Association dinner on Nov. 16. She reported on the Anderson Springs wastewater project. The Lake County Board of Supervisors signed a contract for construction of the collection system earlier this month. The focus of Coppinger's presentation explained how Lake County's recycled water pipeline to The Geysers has benefited Lake County users and replenished and stabilized the steam decline of the world's single-largest geothermal resource developed for electric generation. The recycled water is treated wastewater (secondary treatment standard) from four wastewater treatment plants which serve 10 communities and conveys 85 percent of Lake County wastewater for steam production. In just 45 days the drilling of test wells for the exploration of geothermal energy is expected to be completed in Nevis, according to Hon. Mark Brantley the Minister assigned to the geothermal project. Once drilled, the geothermal reservoir data collected will measure the necessary performance data, geologic and reservoir information needed for the turbine heat exchangers and production well design. Six local men have already been employed to work on the geothermal project. State-owned China Petroleum & Chemical Corp, also known as Sinopec, said it will further develop geothermal energy in Xiongan New Area, Hebei province, as it seeks to make the smog-ridden region smokeless. 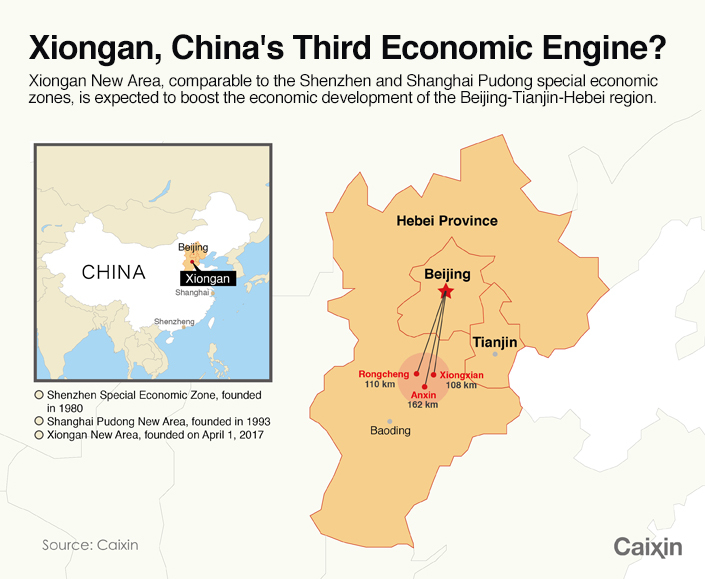 Sinopec Star Petroleum Ltd, Sinopec's geothermal energy development arm, said it would increase the geothermal and other new-energy heating area in Xiongan by 10 million square meters to 16 million sq m in 2017. In 2016, by replacing coal with geothermal energy, the geothermal heating area in Xiongxian county, part of Xiongan New Area, reached 4.5 million sq m, making it the first region to achieve its smokeless city plan. Research Scientist I & II, in Reykjavik, Iceland. Initially for 24 Months from January 2018. Apply by November 30, 2017. Reykjavik Energy, in collaboration with several partners, funded the Carbfix Project in 2007. The project aims at developing safe, simple and economical methods and technology for permanent CO2 mineral storage in basalts. Reykjavik Energy recently received funding from the European Union’s Horizon 2020 research and innovation programme under grant agreements No. 764810 and 764760 for two projects to continue the development of these technologies: Science for Clean Energy (S4CE) and CarbFix2. To achieve the goals of the funded projects we invite applications from highly self-motivated individuals for two positions within the Department of Research and Development, which is responsible for managing natural resources, innovation and technical development. Initial appointment for both positions is for 24 months, and may be renewed contingent upon satisfactory performance and fund availability. The workplace is Reykjavik Energy headquarters located in Reykjavik, Iceland. Positions are available as of January 2018. To ensure full consideration, please send a letter of application and a full resume to carbfixjobs@or.is by November 30, 2017. The European Geothermal Innovation Award is awarded annually to companies which have made an outstanding contribution towards the field of geothermal energy in the form of innovative products, scientific research or project initiatives. It is the seal of excellence applied to the most intelligent and important ideas in research and industry which will play a key role in the future development of geothermal energy. 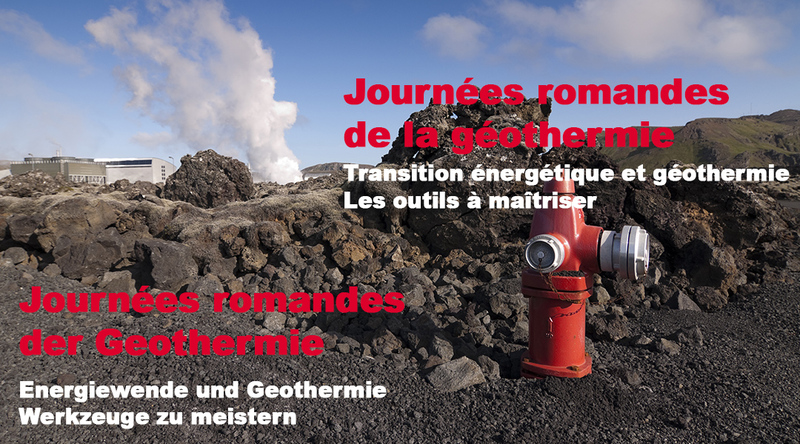 The award is organised jointly by EGEC Geothermal and Messe Offenburg, organisers of the GeoTHERM fair and congress. State-owned electricity firm PLN and PT Supreme Energy Rantau Dedap (SERD) have signed an amendment to the power purchase agreement (PPA) for the Rantau Dedap geothermal plant to be built in Muara Enim, South Sumatra. The PPA Amendment which includes tariff adjustment is an important step for the Rantau Dedap PLTP project, following the completion of the drilling of six exploration wells in 2015 and feasibility studies in 2016. The exploration activities confirm that the capacity to be generated is sufficient to build a power plant with a capacity of up to 86 MW (net) for phase I. The drilling rig has been set and drilling will officially begin momentarily. This well is to confirm geothermal reservoir properties including flow rate, temperature and sustainability. Zorlu Enerji, dünyanın en büyük jeotermal etkinliklerinden bir olarak kabul edilen 41. 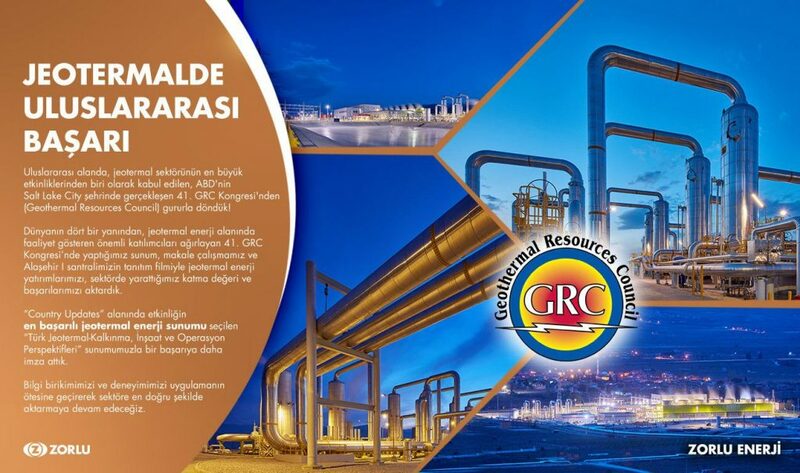 GRC Kongresi’nde (Geothermal Resources Council); Türkiye’deki jeotermal enerji alanına yönelik gelişmeleri ve Zorlu Enerji’nin jeotermal enerji alanındaki yatırımlarını katılımcılarla paylaştı. 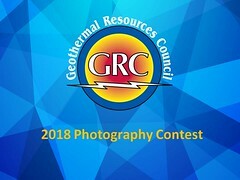 (From Google Translation) Zorlu Energy attended the 41st GRC Annual Meeting (Geothermal Resources Council), considered one of the world's largest geothermal events; Developments in geothermal energy field in Turkey and investments of Zorlu Energy in the field of geothermal energy were shared with participants. Þórdís Gylfadóttir, Minister of tourism, industry and innovation, connected officially Þeistareykjavirkjun to Landsnet‘s power grid. 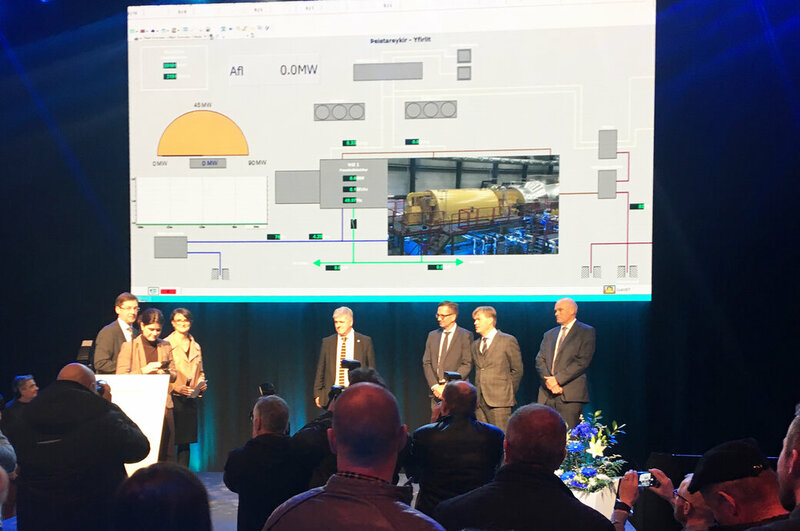 The power plant will improve the electricity supply for the northeastern part of Iceland and provide electricity to PCC Bakki Silicon. Today, in New York, the Commissioner in charge of International Cooperation and Development, Neven Mimica and the President of the Caribbean Development Bank, Dr Warren Smith, announced the formalisation of an EU grant contribution to the Geothermal Risk Mitigation Programme for the Eastern Caribbean. The Programme will facilitate the development of up to 60 MW of geothermal energy capacity in up to five countries – Dominica, Grenada, St. Kitts and Nevis, Saint Lucia, and St. Vincent and the Grenadines. The €12 million in grant funding will be used to provide investment grants at the exploration phase, as well as technical assistance to support capacity-building initiatives and studies that explore opportunities for, and the feasibility of, interconnection between islands to facilitate the export of electricity by geothermal energy producers. Work has begun on the 5 MW first phase of a geothermal power plant in Songa, Bacan island in the regency of South Halmahera, North Maluku, tapping into a geothermal reserve, which has a possible capacity of 140 megawatts. Plans are for the final geothermal power plant to have a capacity of 2x10 MW. Eight Los Alamos National Laboratory (LANL) technologies won R&D 100 Awards last week at R&D Magazine’s annual ceremony in Orlando, Florida. These “Oscars of Invention” honor the latest and best innovations of the past year. Discrete Fracture Network Modeling Suite (dfnWorks) is a computational suite that simulates and predicts the flow and transport of fluids through underground fractured rock. It covers length scales that range from millimeters to kilometers, can run on computers as small as a laptop and as large as a supercomputer and requires minimal effort to create representative models. Applications for dfnWorks include helping catch rogue nations performing underground nuclear tests and maximizing the extraction of natural gas, oil and geothermal wells while minimizing environmental impacts. High-Temperature Electric Submersible Pump Motor (HT-ESP) is rugged and reliable, offering improved thermal performance compared to conventional submersible pumps used in deep underground and extremely hot environments. Whether electric submersible pump motors are used in drilling deeper for oil and gas reservoirs or tapping into geothermal resources of energy, they must operate in harsh, extremely hot environments. Current pump motors overheat and must be replaced often. To solve this, the Los Alamos and the Chevron Energy Technology Company research team developed two technologies for HT-ESP to lower the internal operating temperature of the motor. The start of the Early Market Engagement (EME) for the Geothermal project is being commenced proactively with potential public-private partners so as to move Montserrat's geothermal energy project forward. Exergy are the developers, engineers and producers of Organic Rankine Cycle (ORC) systems, with the innovative, pioneering Radial Outflow Turbine. By 2030 the world must reduce its CO2 emissions by 12-14 gigatonnes if it is to meet the target of keeping temperature rises below 2 degrees centigrade. Steel is playing an indispensable role in renewable energy technologies, helping to harness the power of the wind, the waves, the sun and the earth itself for the transition to a more sustainable energy mix. Quintessa are supporting an exciting new PhD research project at the University of Edinburgh, continuing our close cooperation with Chris McDermott. Fiona Todd will be investigating the practicality of using flooded, abandoned mine workings as a geothermal heat source – potentially a key supply of low-carbon energy for those cities with a long-standing mining heritage. The large area of typical mine workings and the elevated temperature at depth, make such underground voids a potentially very efficient means of accessing the heat being generated at depth in the Earth. Her focus will be on understanding the stability of the mined caverns, looking at the coupled Thermal-Hydraulic-Mechanical (THM) behaviour of the mine supports and the potential ground-surface impact. 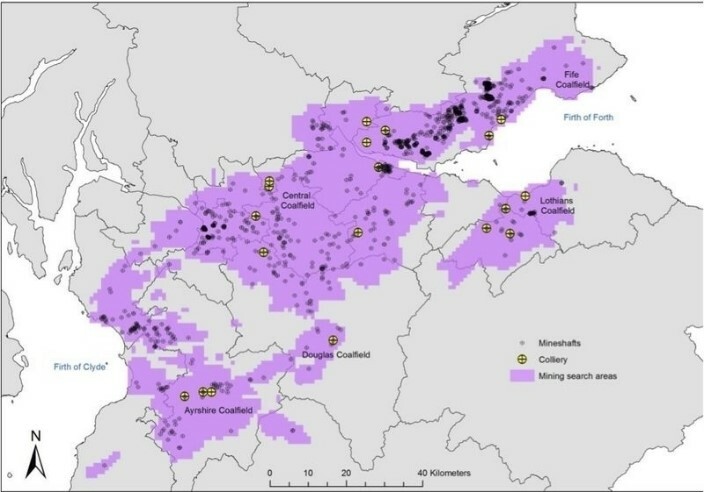 A key source of data will be from the Clyde Gateway (Glasgow), where a complex geometry of mines exist at a range of depths; Fiona will be working closely with the BGS and the Coal Authority to take full advantage of the available data. Exergy took part today at the inauguration ceremony of the Pico Alto 4 MWe geothermal power plant held in the stunning scenery of the Island of Terceira, in the Azores. The plant designed and built by Exergy and the Portuguese company CME for EDA Renováveis, owned by EDA, the Azores power utility company, is now in commercial operation providing green baseload electricity to more than 56,000 inhabitants of Terceira, meeting up to 10% of the island electricity needs.. The 4 MWe binary plant utilizes a high enthalpy geothermal resource, exploiting the heat available both in steam flow and geothermal brine. For this challenging project located in a remote site, in the center of Terceira Island, 1500 Km off the coast of Portugal, the Exergy - CME Consortium supplied a turnkey solution, including the engineering and construction of the gathering systems, the air cooled ORC unit equipped with Exergy Radial Outflow Turbine and all balance of plant equipment. The presentation (in German) will show the potential and development of the geothermal market in Turkey, which currently is one of the most dynamic geothermal energy markets worldwide. In addition, an overview of the geothermal potentials and the activities in the Black Sea bordering states will be given. Furthermore, possibilities for activities and chances of drilling industry and service companies in the geothermal energy market are presented and discussed. A large borehole is being drilled in Satigny. It will reach 650 meters down. Geologists believe the water temperature at that depth will be around 25 to 30 degrees. There will be a further six bores drilled in the next three years. The canton hopes the new power source will cut the use of heating oil by 53 percent. 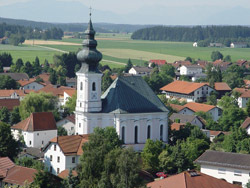 But the holes go nowhere near the depth of the ones in Basel and Sankt Gallen which were blamed for creating small earthquakes. Those were down to a depth of around 5 km. Nevada State officials pledged $1 million this week to a years-long effort to land a national geothermal laboratory near Fallon. The Fallon site is one of two locations competing to serve as the main hub for the Department of Energy’s geothermal research. The other possible site is in Utah. The federal agency is expected to pick a site next year. Researchers have been developing the Fallon project since November 2014, when a proposal was first submitted to the Department of Energy. In late 2016, it was selected as one of two possible sites for the Frontier Observatory for Research in Geothermal Energy (FORGE) lab. Since then, a team of researchers from organizations and national labs, has been conducting environmental reviews, drilling test holes and working on getting federal land permits. For utilities that buy geothermal, this could change the economic equation. The 90 MW Theistareykir geothermal power plant was commissioned today. The plant is the third geothermal plant by Iceland’s Landsvirkjun. The plant's 1st phase commissioned today is 45 MW and the 2nd phase of another 45 MW will be on-line in April 2018. Today’s ceremony was attended by high ranking government and municipal officials as well as Landsvirkjun and contractor staff. Mannvit played an important role in the project development on behalf of Landsvirkjun. Click here for more info on the Theistareykir GPP. San Diego on Thursday took another step in the lengthy process of establishing a community choice aggregation market for city residents and businesses, as the city's Sustainable Energy Advisory Board voted to send a feasibility study completed in July to the city council with a recommendation to move forward on its action points. Under community choice, a city government or nonprofit takes over the role of buying and selling power, while the local utility maintains control and maintenance responsibility for transmission of that power, collecting a fee for doing so. Residents who wish to opt out of the program and continue buying power directly from the utility have an option to do so. Advocates say that such a choice puts downward pressure on electric costs while increasing the amount of renewable power on the grid at a rate faster than utilities are currently ramping up reliance on solar, wind, and geothermal generation. Community Choice Aggregation in California - An Opportunity for the Geothermal Industry [July/August 2016 Bulletin] by Paul Brophy, Past-President, Geothermal Resources Council, and Vice-Chair, Business Operations Committee, Sonoma Clean Power. The Bureau of Land Management (BLM), Mount Lewis Field Office, has prepared and made available for public comment an Environmental Assessment (EA) for the Phase III McGinness Hills Geothermal 45 MW Expansion Project. The first McGinness Hills geothermal plant was established in July, 2012 and has been producing renewable power. In an addendum to the McGinness Hills Geothermal Development Project, Ormat Inc. is proposing the addition of new Phase III facilities that will total approximately 42 acres. On November 15-16, 2017, the U.S. Department of Energy (DOE) co-hosted the sixth annual Clean Energy Education & Empowerment (C3E) Women in Clean Energy Symposium in partnership with the MIT Energy Initiative and Stanford University’s Precourt Institute for Energy. At the Symposium, ten accomplished women from across many disciplines were recognized for their achievements and leadership in clean energy. U.S. Secretary of Energy Rick Perry expressed his congratulations and gratitude via video message during the event. Among the women recognized and receiving awards was Nicole Lautze in the Education category, an associate faculty member at the University of Hawaii Manoa, where she founded the Hawaii Groundwater and Geothermal Resources Center. She leads a team of senior scientists in the development of an updated geothermal resource assessment for the state of Hawaii.